Convert XML export files from iView & Expression Media to CDFinder catalogs. Is there a better alternative to CDFinder Transporter? Is CDFinder Transporter really the best app in Author Tools category? Will CDFinder Transporter work good on macOS 10.13.4? CDFinder Transporter... Convert XML export files from iView, iView MediaPro, and Microsoft Expression Media (1.x and 2.x) into CDFinder catalogs. All relevant MP3, EXIF, IPTC, GPS, and other meta data and thumbnails stay intact. CDFinder Transporter needs a review. Be the first to review this app and get the discussion started! 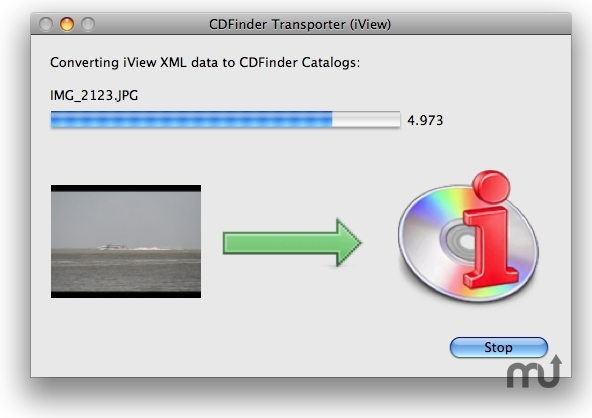 CDFinder Transporter needs a rating. Be the first to rate this app and get the discussion started!